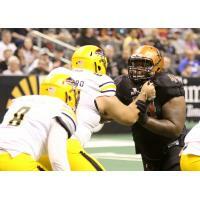 PHOENIX - The Arizona Rattlers (3-0) won their first ever meeting against an in-state opponent, defeating the Tucson Sugar Skulls (2-1) 63-28 in front of 16,110 fans at Talking Stick Resort Arena on Saturday. 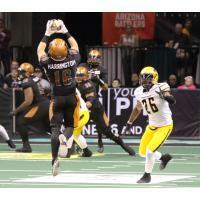 "I thought the (Tucson) coaching staff did some good things that we weren't ready for and we kind of adjusted as the game went on," Rattlers Head Coach and General Manager Kevin Guy said. "As we got a feel for them and got the turnovers, then the game got a little stronger." 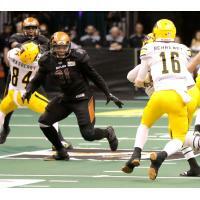 Rattlers QB Verlon Reed Jr. was 7-of-12 passing for 121 yards and three touchdowns, and also ran for 33 yards on five carries and two rushing touchdowns. RB Jabre Lolley also had two rushing touchdowns and a receiving touchdown. Reed said that despite the slow start to the game, they were able to get things turned around. "Once we got the ball rolling, we started getting some turnovers and started speeding up the clock, I think the game started to swing in our favor," Reed said. "We just took momentum and we made sure that we kept it for the rest of the game." Arizona's defense came up with another strong performance, holding their opponent to fewer than 30 points for the second time in three games. LB Davontae Merriweather and DL Lance McDowdell both came up with a fumble recovery, while DL Chris McAllister and DL Nikolaus D'Avanzo both had a sack. "We put in a lot of work, we're staying focused, and we know what we got to do," Merriweather said. "We just got to keep practicing." Tucson started with the ball and drove down the field, but Arizona's defense held them to a field goal attempt by K Diego Marquez, who missed. After a three-and-out by the Rattlers offense, the Sugar Skulls would get on the board first with a 2-yard run by Jones. Arizona would answer back as Reed found WR Dezmon Epps for a 26-yard touchdown pass to tie the game at 7-7. The Rattlers would take the lead early in the second quarter with 14 points in the span of 1:08. First, D'Avanzo blocked a Marquez field goal kick and DB Dillion Winfrey recovered the ball in the end zone for a touchdown. Then, after McDowdell forced a fumble and recovered the ball, Reed would score on a 3-yard run, putting the Rattlers up 21-7. The Sugar Skulls would counter with a 16-yard touchdown run by QB Matt Behrendt. On the next Rattlers possession, Reed would find WR Markis Sumpter for a 13-yard pass to restore Arizona's 14-point advantage. The Rattlers would add on another seven points in the final minute of the half as Reed threw his third touchdown pass of the game, finding Lolley for a 29-yard completion. Arizona started the second half with the ball. After Reed found WR Jamal Miles for a completion on fourth-and-10 to keep the drive going, Reed would run it in from the 7 to give the Rattlers a 42-14 lead. QB Jeff Ziemba would come into the game with 6:07 left in the third quarter and extended Arizona's lead with a 7-yard touchdown run. 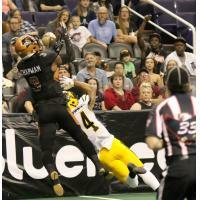 The Rattlers would score twice early in the fourth quarter. First, Lolley would run 25 yards to put Arizona up 56-21. Then, on the ensuing kickoff, Epps would force a fumble that Merriweather recovered. Two plays later, Lolley scored from 3 yards out to give Arizona a 42-point lead. Tucson would get the last score of the contest with QB Jake Medlock finding WR Jarid Brown for a 22-yard touchdown pass. Arizona now takes their second bye week in three weeks. The Rattlers return to action on Sunday, March 31 for a 3:05 AZT matchup at Talking Stick Resort Arena against the Sioux Falls Storm (3-0). Fans can watch all the action on Your Phoenix CW or on YouTube Live.